This IS what I NEEDED! This one of those times where my head is aching so that I cannot lay horizontal and every few minutes the floors are paced, while stinging pain comes in clusters – which are cascading packages of headaches like migraine bombs going off in my head. If you are reading this and do not know me, you might take that as a complaint – let me assure you, it isn’t – oddly enough, some of my most creative work comes when I can do nothing else but find something to take my mind off of it. In the lulls, writing, designing, researching is done – during the worst of them is when the praying, pacing and checking of time to when the next abater can be taken of a careful regiment of pain management depending on the severity of the specific cycle. This set has been in my head all week – with this SPECIFIC image in mind – a dragonfly. Dragonflies have always interested me as they can be so varied in size, color and features. 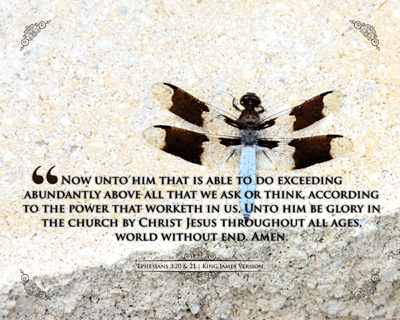 This one in particular reminds me of the following two verses in Ephesians – incredible handiwork orchestrated in an insect, just as He orchestrates a work in us that is WELL beyond our ability to even comprehend, much less do by ourselves. How does the work get accomplished in us? According to the Power that Worketh in Us – the HOLY SPIRIT. How much? Above All. How so? Abundantly so. To what level? Exceeding He is Able. Whatever the trial, whatever the difficulty, whatever the unknown – He can and will use the Holy Spirit to guide, direct and provide for each born-again believer throughout ALL ages – not just some time ago and maybe in the future. He can DO those things for each of US right now!